Beach, pool, tennis and pet friendly! Great views! If you are looking for a spacious, pet friendly home with great views AND access to pools and tennis, look no further! This house does indeed have it ALL! Welcome to our wonderful beach house "Chill Out" on the beautiful Fort Morgan Peninsula. Be prepared to relax at this professionally decorated, pet-friendly house. Located on the gulf side of scenic Ft. Morgan Road between mile markers 6 and 7, the Morgantown community features two swimming pools and two tennis courts. 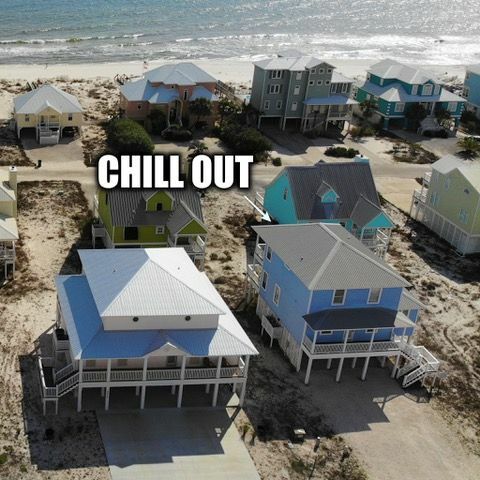 There are four community beach access & boardwalks to the only pet friendly beach in the Gulf Shores area. The neighborhood is walking & biking friendly. "Chill Out" is located at 6066 Sawgrass Drive, Gulf Shores, AL 36542. May 25 - August 16 has a 7 night minimum stay with a Saturday to Saturday check in. My name is Kevin Wendelburg. I am a property owner, a real estate investor, and an Alabama real estate agent committed to 100% customer satisfaction. I will strive to under-promise and over-deliver with everything that I do. Hard work, personal responsibility, and an over achieving desire to provide the best product on the market are the cornerstones of my business, RelaxontheBeach. I started RelaxontheBeach in 2004 because I knew that the vacation rental/property management business in Gulf Shores needed a complete overhaul. I purchased my first beach house in the early 2000's and immediately listed it with one of the larger property management firms in town. While I was thrilled that the house rented as well as it did, I was not happy with the draconian commission structure, poor cleaning standards, and slipshod maintenance. I began to advertise and manage my property on my own and I doubled rental revenue in the first 24 months of owning the property. Neighbors took note. I received phone calls. I received emails. How in the world, they wondered, was I able to generate so much traffic? Every weekend there was a car in my driveway. 'Simple' I said, 'treat every customer like family.' The personal touch makes all the difference. Our potential guests are personally greeted by a knowledgeable representative. Our quality control director takes pride in the condition of all of our properties and ensures that our thorough cleanliness standards are met. We have a full maintenance department that does its best to address any maintenance concerns quickly. We strive to provide guests with all the creature comforts of home. All RelaxontheBeach properties feature high speed Internet access and cable television. Many are pet friendly! We want you to feel like you are getting a tremendous value for your vacation dollar. We want you to come back, and we want you to tell your friends. Give us a try. A great vacation awaits! We loved the chill out home! The chill out home was awesome! It was very clean and very spacious. The walk to the beach was quick and my kids loved the pools. Morgantown was a great place to stay. It was very quite. My family had a great time there. We plan to return. Elizabeth, we are happy to hear that you enjoyed Chill Out as well as Morgantown. Chill Out really is a great home and, as you found out, Morgantown is a wonderful community to vacation in. We hope to see you again soon! The property is great just a short walk to the beach access the only issue we had was the cleanliness of the property. I&#x2019;m not one to be real picky because I know it is a beach house there&#x2019;s going to be saying and I&#x2019;m fine with that but there was dust on a lot of things that shows it has not been cleaned properly in a long time other than that great property great views. The house was in good shape except for the upper level balcony. The railing was very rickety and the kids couldn't lean on it. Also, one of the chairs was completely rusted and broken into pieces. Thanks for letting us know. We'll get on it! We're glad you had a good stay! Wonderful! We had a great week. Loved this beach house! We're so glad you had a great week in our home! Please come back and do it again for Vacation 2019!! We had a great time for this Labor Day week-end relaxing on the beach and enjoying good quality family time. This rental was perfect for our group of 8 adults and 4 kids ranging in age from 4-15. The kitchen is well supplied for fixing meals in the place instead of waiting in long lines at busy restaurants. The rental was clean and ready for our group. I would recommend this rental. We did rent golf carts which helped to get my disabled husband and the younger ones to the beach access. It also helped to get all the chairs and tent to the beach. All agreed it was a great time. We're pleased you had a great time. Please come back and celebrate with us again next year! Location was wonderful. Plenty of space for family. Nice neighbors. Really enjoyed vacation. We're so glad you enjoyed your vacation and our wonderful neighborhood. Please come back again soon!